Another week of cross training in the books. Since this injury is taking longer to recover from than I’d hoped, I’ve scrapped the “tentative racing schedule”. I’m not sure I’ll be ready to come back for a spring marathon. Right now, the goal is to just keep grinding through the cross training and slowly transition into running. To that end, and with the guidance of my sports medicine doctor, I’ve started to incorporate some running on an Alter G treadmill—a contraption that allows you to run at a percentage of your body weight, thus lessening the impact. I tried 30 min at 70% on Thursday, which seemed to bug the foot, and then 30 min at 50% on Saturday, which wasn’t perfect but was acceptable. I’ll try that again tomorrow. 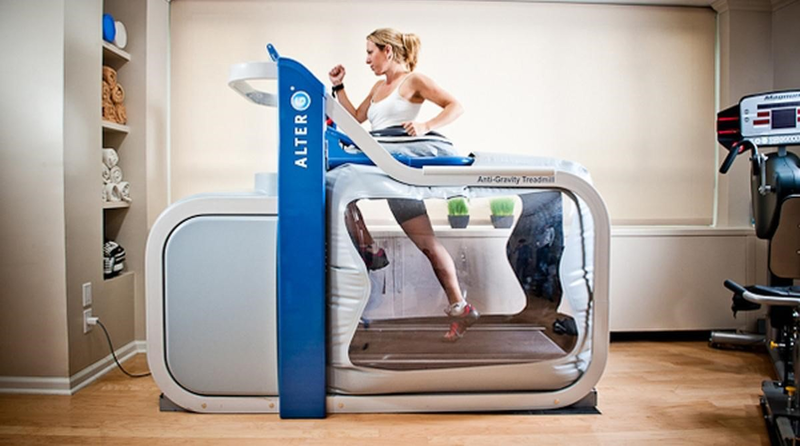 Here’s what an Alter G looks like. In last week’s post, I talked about running for post-collegiate athletes. Specifically, I addressed some of the barriers that keep good collegiate runners from continuing to train after college. One of those barriers is a lack of goals, with the exception of the Olympic Trails in the marathon. So today I’ll talk about that. In general, each country at the Olympics can have three representatives per Track & Field event (the marathon is part of T&F). To select its “team”, the US Association of Track & Field hosts the Olympic Trials. The Olympic Trials consists of a track meet held a couple of months before the Olympics, plus a marathon held ~6 months before the Olympics. The top 3 runners in each event will represent the US at the Olympics, provided that they’ve also met the Olympic qualification standards (which are sometimes the same as the trials standards anyway). For races held on the track (i.e. everything except the marathon), the number of people who qualify for the Olympic Trials is quite small. This is by design (i.e. tough qualification standards) because a) only a handful of people actually have a shot of qualifying in each event and b) you can only fit so many people on a track at one time. In the marathon, however, b) does not apply. You can fit plenty of people on the road. For this reason, and also because of the Olympic standard in the marathon, the US Olympic Trials qualification standard is relatively lax. A lot more people can qualify in the marathon than in the other events. More lenient qualification standards mean more people can qualify for the marathon than other Trials events. Can you spot the former Nashvillian in this photo??? Thus, instead of just the very elite competing for a spot at the marathon trials, hundreds of people have a chance to qualify. But since the qualification standard is quite challenging for most people, qualification is still considered a respectable accomplishment. The trials standard is just tough enough to push most former collegiate runners, but not so tough that only a few people can achieve it. And so, hundreds of people (including me) try to qualify each Olympic cycle. We modify our lives, put in the mileage, and give this everything we can. Of course, this is kind of arbitrary goal. What’s so special about running 2:18:59 versus 2:19:01, especially when neither time will really give you any shot and finishing top 3 at the trials (you need to be able to run sub 2:12 to even think about that). But aren’t most goals, especially in running, pretty arbitrary anyway? Even so, it’s nice to have a target to shoot for and a goal to keep you going. And if I only end up running 2:20, or even if I never PR again and have to live with my measly 2:21:51, I’ll still be glad I went for it and proud of what I accomplished. But it would be cool to be able to say you’re an Olympic trials qualifier and compete with the nation’s best 😊. Of course, you have to have an intact foot to do all that. So right now I’ll focus on grinding away in the pool and on the bike. Nashville Running Company is a specialty running store offering a unique selection of shoes and expert advice to give you a better running experience on the road or trail. New product announcements, events, sales, and specials!